Saturday. I didn’t think you would ever get here. Benzo and I both had stressful, busy weeks at work. So are we ever glad to see Saturday. I still might have to work a little bit today or tomorrow, but it shouldn’t be anything too crazy. I will be very glad when January is over! So I meant to put this blog post up earlier in the week, but I’m just now getting around to it. Last Saturday I made some delicious oatmeal bars from a recipe on Oh She Glows that I have had my eye on for several weeks now. 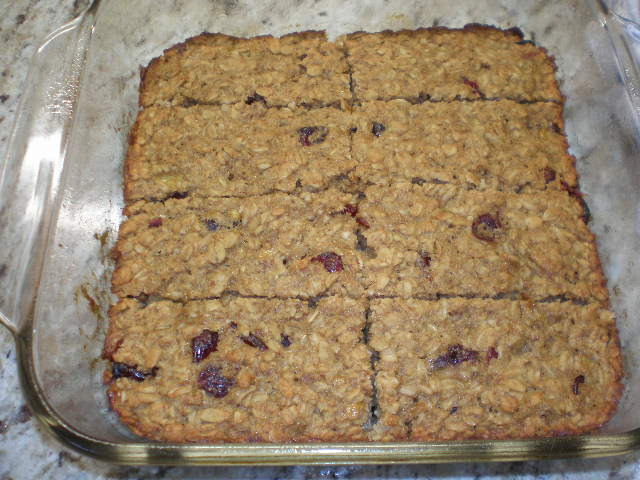 It was Healthy Banana Cranberry Oat Bars. I feel like I need to have more homemade, healthy snacks around the house. I usually have fruit and soy yogurt and Larabars on hand, but it’s nice to change it up. Besides Larabars are expensive! I had everything I needed already on hand! I left out the unsweetened coconut flakes. I’m not a huge fan of coconut and I didn’t have any on hand anyway. I used cranberries instead of raisins. These bars turned out great! They were a real cinch to whip up. 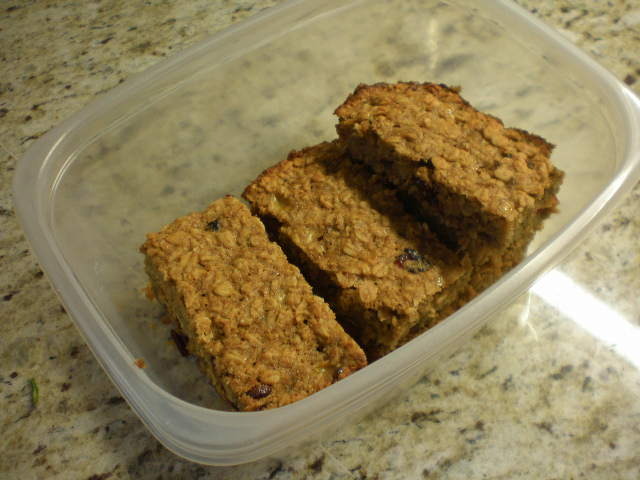 I thought they would be like granola bars, but they turned out more cake-like. Benzo ate them for breakfast and I enjoyed them as a afternoon or pre-workout snack. I found one bar to be a very satisfying snack. It really kept me full. Because of that I never felt like I wanted to gobble up the entire pan in one sitting, which is often the case with other cookies or bars. One was enough. I may try increasing the amount of oats. I love oats! Although I loved the banana and cranberry combination, I will definitely try different mix-ins for variety. Some ideas rolling around in my head are walnuts, almonds, chopped dried apricots, mini chocolate chips, pepitas, sunflower seeds, dried blueberries, and chopped dried pineapple. If I can freeze these bars I may never need to buy granola bars at the store again. 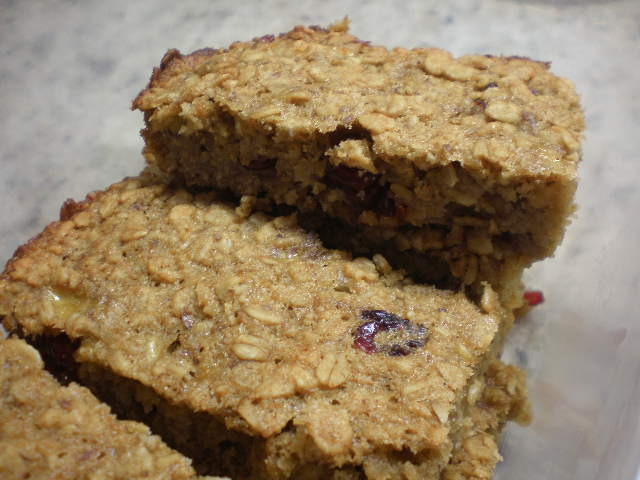 If you have a great homemade granola bar recipe, please share it in the comments. And what would you mix into your homemade granola bars? I made this recently and put half the batch in the freezer. I wrapped each bar individually, then put them all in a freezer bag. I just ate the first defrosted one today (they’ve been in there about 2 weeks, I’d say) and the flavor was spot on. They seemed a bit more crumbly than the fresh ones were, but still held together pretty well. I’m hoping to make a chocolate chip peanut butter version!